Southern Hills Community Bank was one of the Lynchburg Lions Club Candy Sale sites. 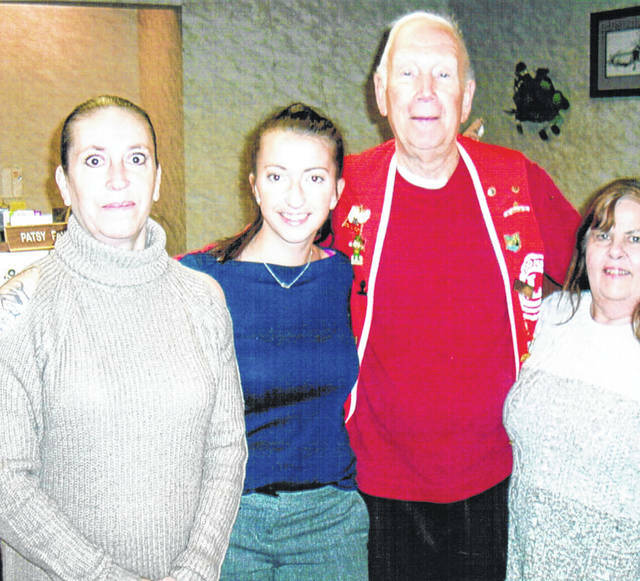 Pictured, from left, are bank staff members Deena Jones and Laura Musselman, Lynchburg Lions President Bob Roth, and bank staff member Patsy Fauber. Lukas Pharmacy in Lynchburg was one of the Lynchburg Lions Club Candy Sale sites. 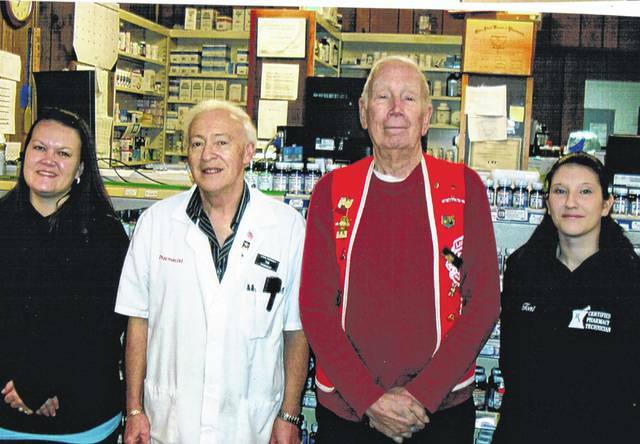 Pictured, from left, are pharmacy staff members Stephanie Berger and Tom Black, Lynchburg Lions President Bob Roth, and pharmacy staff member Toni McQuitty. Downtown Drug in Hillsboro was one of the Lynchburg Lions Club Candy Sale sites. 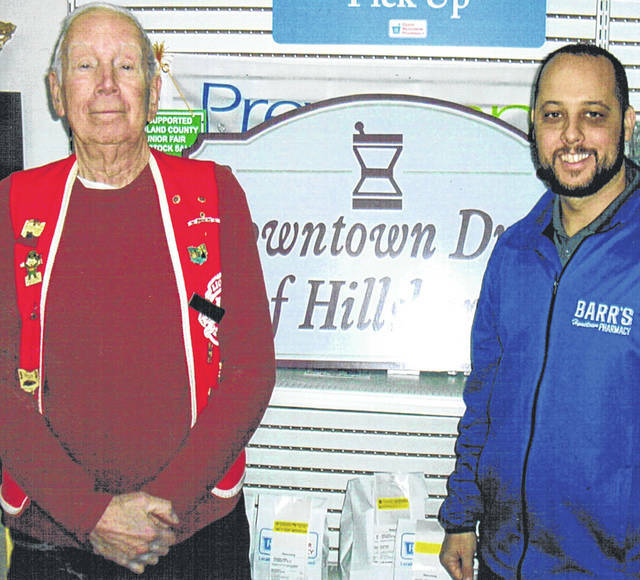 Pictured are Lynchburg Lions President Bob Roth, left, and pharmacy staff member Marcus Barr. The Lynchburg Lions Club has concluded its annual candy sale that began in late November. The club would like to thank all those who supported the sale, with a special thanks to Downtown Drug in Hillsboro and Lukas Pharmacy and Southern Hills Community Bank in Lynchburg for providing display areas and money collection service for the candy. The club will use the profits from the sale for more than 25 community service projects. Those projects include donations to eye research, pilot dogs, Lions International disaster relief, Canine Companions, Lions Foundation, various pieces of equipment for the blind, the Lions Quest educational training program, KAMP Dovetail, Ohio disaster relief assistance, new eye glasses for needy children, diabetes research, Central Ohio Lions Eye Bank and cornea transplant service, the GOOD program for all fifth graders at Lynchburg-Clay Elementary that promotes character and personal development, the Peace Poster Contest for sixth graders, donations to the Buford Farmers Institute, used eye glasses for the needy all over the world, measles vaccinations for thousands of people worldwide, The Ohio School for the Blind Band, Ohio Lions Club, pediatric cancer research, sight and hearing development, Personal Energy Transportation machines for the handicapped, donations to families in the local area including donations to special benefits programs, Redi-Fast and other local support programs for the schools, Lynchburg-Clay Athletic Boosters, and other donations as needed throughout the year. Submitted by Jim Faust, Lynchburg Lions Club.